Whales have returned to Howe Sound--so now it's time to develop strategies that will help them stay and multiply. Linda Williams and daughter Joyce Williams of Skwomesh Action Group. Kris Krug photo. Pauline Le Bel’s Whale in the Door suggests activities and actions to deep readers’ connections to Howe Sound, as well as a list of groups acting to protect the Sound and an extensive bibliography. Halfmoon Bay: Caitlin Press, 2017. Mink and his sister, Skunk, gave a big potlatch on Gambier Island in Howe Sound. All the animals from around the area came to his longhouse. Mink also invited Whale. After everyone else was already inside, Whale swam fast and launched himself onto the land in order to peek his head into the door of the longhouse. His large head trapped the others inside. This was all part of Mink’s plan to get everyone together and force them to talk to each other. 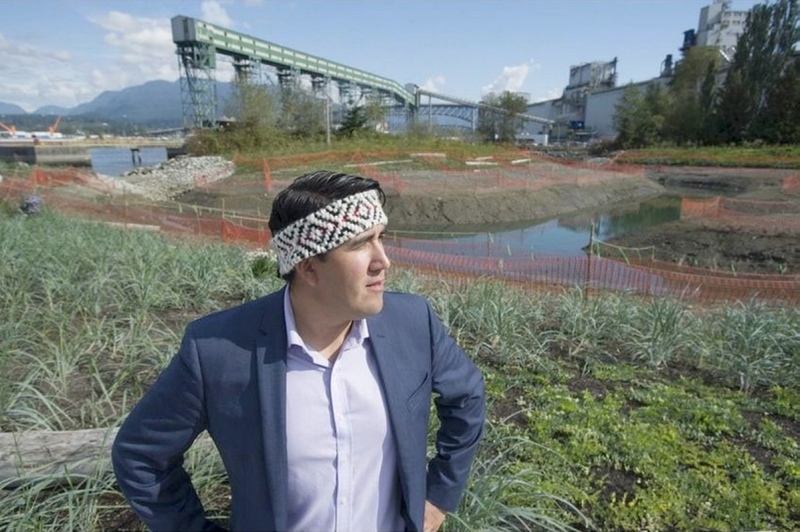 This was a story the elders once told to Chris Lewis, former policy advisor to the BC Assembly of First Nations and a spokesperson and elected councillor of the Squamish Nation. Years later, he related this story at a workshop. 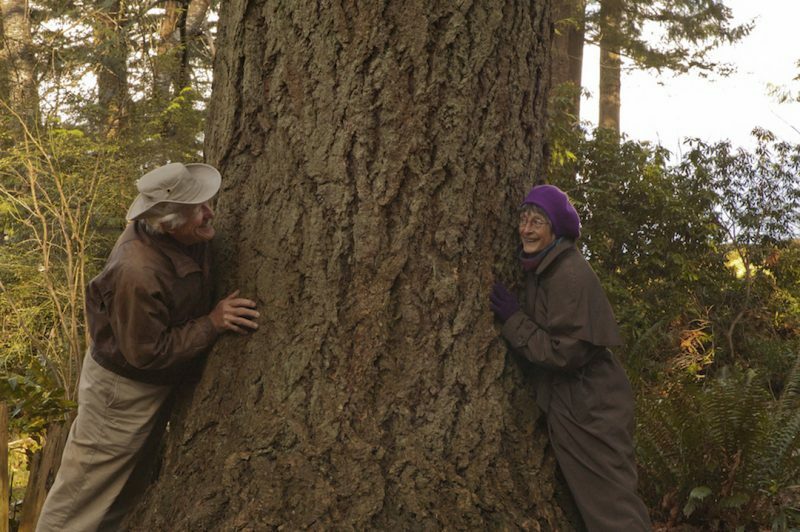 For Le Bel, it was an inspirational legend and suggested an apt title for her meticulous and balanced study of how a community can reach out to help nature heal itself. Chris Lewis of the Squamish Nation at New Brighton Park, Vancouver. Times-Colonist photo. Howe Sound/Atl’kitsem was a saltine strip of ocean under siege long before anyone knew it. 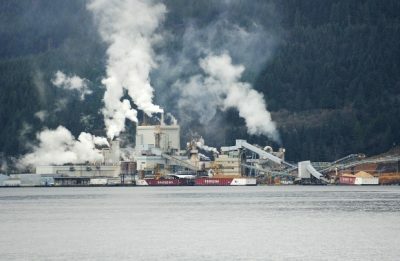 Woodfibre Pulp Mill had been in operation since 1912 and Port Mellon since 1908 when, as a youngster in the 1960s, I recall stopping with my parents on a Sunday drive to pick up oysters near Howe Sound’s Porteau Cove. We all loved to savour them raw so we opened one on the spot, horrified to find it a bright green. We tried a few more, only to reveal the same unnatural hue. Woodfibre mill near Squamish, 2006.
Who knew? Back then “pollution” was hardly in our vocabulary. We had no idea that the dioxins and furans had been spewing from both pulp mills for years with deadly results, and then in 1975 the heavy metal runoff from Britannia Mines joined the toxic mix. It was almost two decades later before Greenpeace tested the waters and brought the state of the sound’s shaky health to the nation’s attention. Ultimately a treatment plant was built to deal with the mine’s contaminated waters and Woodfibre shut down its operations. Port Mellon, on the other hand, now called Howe Sound Pulp & Paper, turned itself around, becoming an environmental success story, possibly even having one of the cleanest pulp mills in the world, according to MLA Elizabeth May in the book’s Foreword. 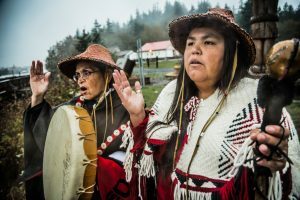 So the good news is considerable: the recovery of the waterways, a First Nations cultural resurgence, language revitalization and renewed rituals, and environmentally, the protection of old growth forest in the Elaho Valley. So does this mean that Whale in the Door is a much-needed environmental good news story? Well, yes — and no. Now the door has opened on another threat: plans for a Liquefied Natural Gas (LNG) plant smack dab in this same, almost-healed network of breathtaking fjords. And unlike the US, Elizabeth May cautions in the selfsame Foreword, Canada has no regulations in place for required shipping zones to protect shoreline communities. It’s time for that whale to once again get its head into that doorway. 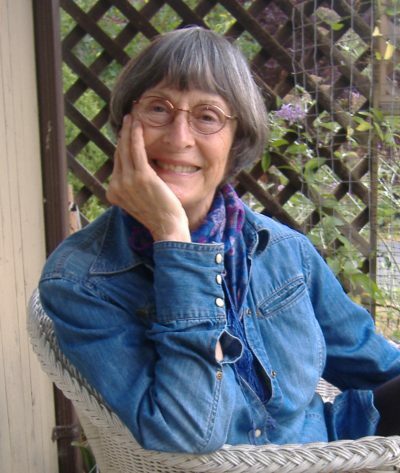 Pauline Le Bel, who has lived on Howe Sound’s Bowen Island for nineteen years, is a singer, songwriter, screenwriter, and award-winning novelist. She documents the Sound’s transition from illness to health along with this new threat on the cusp of the region’s recovery. “My work is fueled by a passionate belief in the power of story to heal our world,” she writes in her Foreword. The book’s eight chapters and comprehensive Afterword and Bibliography are crammed with a balanced mix of first person comments and experiences, facts, quotes from relevant sources, interviews with key figures, and First Nations legends and stories. Le Bel’s film making experience has honed her ability to show more than tell, and to get what she wants from primary sources — the people concerned. She may believe in the power of story to heal our world, but she also recognizes and honours those on the front line: those who take action. Her extensive research would be impressive enough but she puts on her rubber boots and slicker and goes out into the watersheds and backcountry too, spending days with these frontline heroes, committed locals like citizen scientist John Buchanan. Paul and Pauline Le Bel, tree-hugging, 2013. Research is critical to a book like this, but grassroots experience makes what’s between the covers even better. Le Bel helps us to know these diverse people who have worked so hard to save the Sound: Joyce Williams of the Skwomesh Action Group; environmental writer Terry Glavin; anthropologist Wade Davis; habitat biologist Edith Tobe; and Randall Lewis, president of the Squamish River Watershed Society and environmental coordinator with the Squamish Nation; not to mention John Buchanan, with whom she takes a wild road trip to find out how long the Squamish River actually is and to check on its recovering health. All this makes Le Bel’s author’s style very readable, combining sheer poetry with detailed facts, fully fleshed profiles, and straightforward narration. She quotes authorities on diverse issues, intersperses her story with legends, with conversational asides, and with history and experiences. Balancing the 100 new jobs that a LNG plant might provide, she reminds readers of the numbers employed on less invasive commercial initiatives like the Sea to Sky Gondola and points out details, such as the 2,000,000-plus people who now come to the small town of Whistler every year. 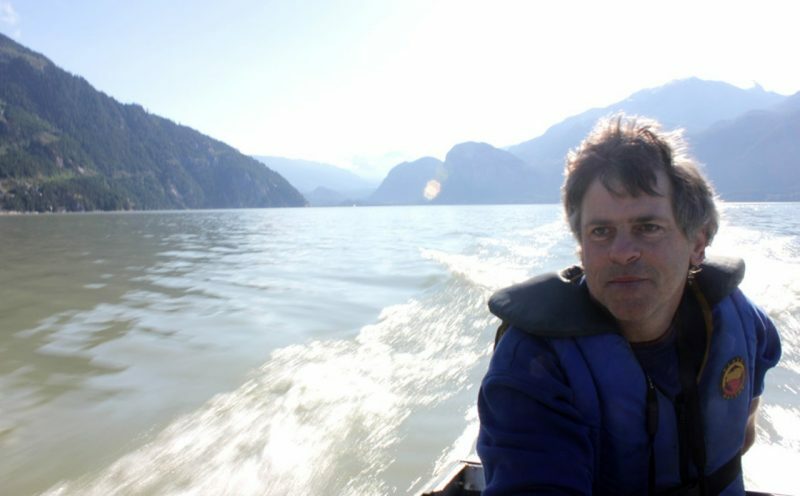 In addition to skiing, hiking and enjoying the outdoors, they also attend the Writers Festival, the Audain Art Museum, which opened in 2016, and the Squamish Lil’wat Cultural Centre, a showcase for the art, history, and culture of the Squamish and Lil’wat nations. And then there’s the emergence of Quest University, Canada’s first independent university, which has grown from 74 students in 2007 to 800 today. These enterprises all generate income without nearly as much negative environmental impact and employ and enrich many more people. 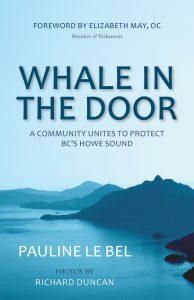 The book also contains a list of activities and actions to deep readers’ connections to Howe Sound, a list of groups acting to protect the Sound, and recommended viewing choices along with a weighty bibliography. A fully documented examination of the story of resource development and its impact on local communities, Indigenous cultures, and the oceans, along with photos and a map of the area are also included. Pauline Le Bel is an author with credibility. Her literary skills and the breath of her research make her topic readable for everyone, including those who might be in favour of the LNG plant. The whales have returned to Howe Sound; we want them to stay. Cherie Thiessen writes reviews and travel features from Pender Island in the southern Gulf Islands. 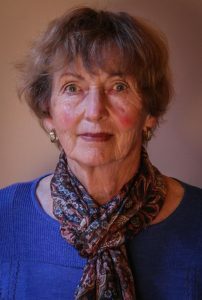 A regular contributor to BC Bookworld for over ten years, she also currently reviews for Pacific Yachting and British Columbia magazines, and in the past has contributed to Monday Magazine, Douglas College’s Event magazine, Quill and Quire, and January magazine. She holds an M.A. from the University of British Columbia and has taught writing at the University of Victoria, Shanxi Teachers’ College in China, and the University of Zululand in Natal.